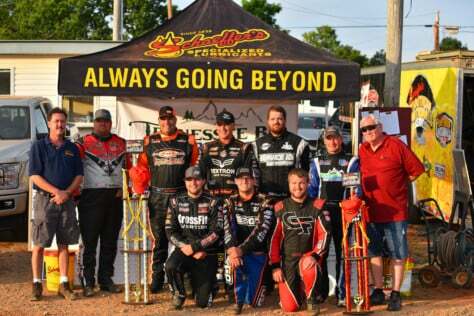 The 2018 edition of the Schaeffer’s Oil Southern Nationals drew to a close on Saturday night at Tennessee’s Tazewell Speedway. Not only was there a $10,000 top prize on the line in the Ray Varner Ford 53, but there was also the $5,053 miniseries championship on the line. Twenty-three competitors looked to tame the high banks of the track, known as “The Bad Fast Taz,” but it was Georgia’s Brandon Overton, who streaked to the $10,000 payday. The finale saw three different leaders with Dale McDowell leading from the outset before Michael Chilton took control in his familiar No. 97 Super Late Model on lap 22. The Salvisa, Kentucky driver paced the field until lap 32, when Overton took control. Not to be one known for easily giving up, Chilton battled back to the lead on lap 44. He would pace the field until lap 50 when Overton took back the top spot. The Evans, Georgia competitor led the final three laps on his way to the $10,000 triumph. The win was Overton’s fifth of the year on the miniseries and the tenth overall of his career with the tour. Donald McIntosh, Michael Chilton, Casey Roberts, and Dale McDowell completed the Top-5. 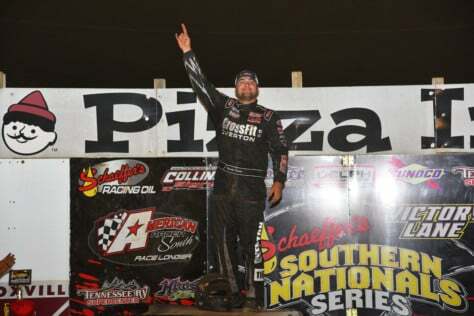 With his fourth-place finish Casey Roberts claimed the second Schaeffer’s Oil Southern Nationals Championship of his career. Roberts achieved the feat aboard the Blount Motorsports No. 101 XR1 Rocket Chassis/ Vic Hill Racing Engine Super Late Model. Forrest Trent was crowned the series Rookie of the Year. Throughout the course of the Ray Cook promoted miniseries eight drivers competed in every event, including Roberts, Overton, Aaron Ridley, Forrest Trent, Craig Vosbergen, Donald McIntosh, Cla Knight and Dale McDowell.